Colato Laínez is a graduate of the Vermont College MFA program in Writing for Children & Young Adults. He was born in El Salvador and was inspired to be a writer by his great uncle, Jorge Buenaventura Lainez, at whose house he first learned the word "escritor/writer." He has been a bilingual elementary teacher at Fernangeles Elementary School, where he is known by the students as "the teacher full of stories." Laínez is beginning a series on La Bloga called Living To Tell The Story: The Authentic Latino Immigrant Experience in Picture Books. Tune in; I plan to. 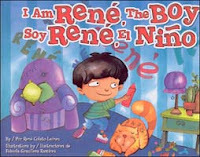 More: Read Critícas' interview with Laínez, and the Papertigers review of I am René, The Boy.